Life is pretty crazy right now. No, honestly, crazy doesn't fully describe it. Overwhelming probably hits closer to the mark. Josh and I are a little overwhelmed. We're overwhelmed by Big Brother A's needs right now. He's got these incredible shining moments where we're so proud of the big helper he is, so full of compassion and love. But then, for every one of those, there are multiple really awful moments where we wonder if we've ruined him by making life too hard. (Also, he's dramatic because we're dramatic. Obviously.) Sometimes, he's the hardest out of all of them. But then there are these incredible moments where he comes in and encourages me when I'm ready to throw in the towel and let the three little ones go Lord of the Flies in the living room while I rock and eat chocolate in the bathroom. We see glimpses of who he can be, and we try to use a lot of prayer, grace, love, aaand sometimes yelling to help him see that, too. Baby Gigi is, you know, a baby. She's an adorable little six month old who doesn't get quite enough practice sitting or rolling because she is at risk of being squashed on the floor pretty much all the time. She's starting to scream (she learned that from Baby S) when she gets a toy taken away. Or my glasses. Or my hair from her tiny but SUPER strong clenched fist. She is joy and sunshine and love, and she gives me motivation. A thousand times a day I thank God for this gift of sunshine. And then I pray that she will never walk. And then I pray no, God, I didn't mean that, but maybe let her be just a little on the slow side. Because I'm not sure how I'll keep up with another one! And Baby S. Oh, Baby S. We are SO glad he is here. So glad. Don't doubt it for a second. (I'm telling you and us.) But life is really crazy hard right now. He's making incredible gains, but he has a very VERY long way to go still. We're fighting so hard. Every little piece of gain that you notice was bought at a price, for him and for us. I am very proud of him for his hard work. But along with those gains and his growing comfort in our home come some behavioral regressions, too. This is typical. There's so much more involved for him than just a learning disability. Sometimes the people in his life forget that. There's the trauma of being shuffled between homes. He was developmentally younger when he came back to us than when he left. I'm always half joking that he and Baby Gigi are going to learn to talk and potty train together. He has the tantrums of a child just learning to use words and realizing that they don't always get him what he wants. But try telling that to a very tall, very strong two-and-a-half-year-old. He's super fast and has no fear of danger. So he just runs, in whatever direction, at any moment, at full speed. And this is why we don't bring the kids anywhere. Running away and screaming in public is exhausting. Except when we do, because I realize we're all missing out and we need to train him and let Big Bro have fun experiences. Josh and I joke that these kinds of outings are "nightmares from which there is no waking." That might sound dark. I told you, we're dramatic people! But it is pretty rough. 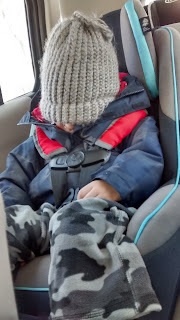 And usually ends with Josh and Baby S waiting in the car while I try to finish off whatever it is we were attempting with Big Brother A, which gets derailed because I also have a six-month-old strapped onto me, who occasionally needs to eat, sleep, or have her diaper changed. I'm not saying this for sympathy. Life with three little ones is hard, period. For all of us who are there now or have been there in the past. I hear it only gets harder as they get bigger! Or at least, a different kind of hard. I believe that. The emotional "hardness" of Big Brother A is much harder than the physical "hardness" of not sleeping because of Baby Gigi. There are also beautiful moments. These are refilling. I try to drink them in extra deeply because the tired seems to run pretty deep some days. Those are the moments when I'm upstairs grabbing someone an extra pair of pants (someone is ALWAYS pooping, you know), and I see two kids' bedrooms upstairs with a toddler bed, a twin, and a crib, and I stop and breathe in how right it is to see those three here in this house together. It's when Baby S grabs Baby Gigi by the toes and says "ee!" (feet!) and then they giggle together. It's when the boys and Josh are wrestling on the floor under the green blanket. It's even when we're leaving a failed attempt at a family event and I look back at all of the little ones contained in their carseats, and I am satisfied because this life and all its ups and downs are exactly what I want. Sometimes I hide in the basement (Big Bro can open gates so he finds me) or in the bathroom (but Big Bro always has to use it when I'm there). Sometimes I pause for an extra moment on the stairs (but then Baby Gigi cries louder and I have to run down to make sure no one is sitting on her). Sometimes I have a second - or third - cup of coffee (it takes me over an hour to get to it, though). Basically what I'm saying is that there is no relief some days. There's no real rest. No down time. No brain-turned-fully-off moments. God is much stronger than me and he keeps filling me in the times when I think I'm beyond being fillable. But sometimes I long for bedtime. Sometimes, I read the last book and shut the last door, and I sigh a great big sigh of relief, grab myself a nice big bowl of ice cream, and shut my brain off in front of the tv with my husband. We call it a date because actually going somewhere feels harder than staying in together right now. I go to bed a little too late and I think I won't possibly have the energy for tomorrow. The days are so very long. The countdown to bedtime is all too real. But the weeks are pretty quick, and from Sunday to Sunday I can see how incredible the growth is in all three of my babies - and in myself, too. We're getting through a day at a time. The hard fight for progress will go quicker than I realize. Someday, I pray, by God's grace, I will look back on this time in disbelief because it's too hard to imagine how far Baby S had to come. It's already like that when I think back to his arrival. He's a fighter, and a sweetheart, and a firecracker. He's a ray of sunshine in our lives and a wrecking ball in our home, and he's growing me in a lot of painful and amazing ways. I can't wait to fully realize someday how God has worked in each of us, all five, through this amazing daily battle to bedtime.